Kamchatka Peninsula in the far east of Russia. The pink area is the Kamchatka Krai which includes some of the mainland to the north. The Kamchatka Peninsula (Russian: полуо́стров Камча́тка, poluostrov Kamchatka) is a peninsula in eastern Russia. It is 1,250 kilometres (780 mi) long. It covers about 270,000 km2 (100,000 sq mi). It is between the Pacific Ocean and the Sea of Okhotsk. The Kamchatka peninsula contains the volcanoes of Kamchatka, a UNESCO World Heritage Site. 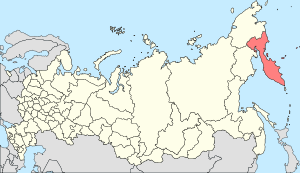 ↑ "Kamchatka Peninsula". Encyclopædia Britannica. Retrieved 2008-02-20. Wikimedia Commons has media related to Kamchatka. This page was last changed on 16 March 2016, at 13:38.